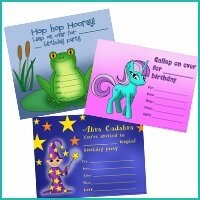 Looking for fun printable birthday party invitations for your kid's birthday party? Look no further. 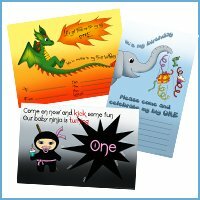 Here on this page you'll find lots of fun birthday themed invites all ready for you to print for your child's birthday. All of these free birthday invitations are drawn by me so you can be sure that they are 100% original. Note: Even though these birthday party invites are complete free, they are for personal use only. Thank you. Maybe your kid is a great fan of cute animals? I know a lot of girls who can't resist small puppies. If that's the case, then this one of printable birthday party invitations may be the ideal choice for your family. This birthday invitation has an image size of 15 cm x 10,78 cm in 260 dpi, which makes it ideal for print - both in terms of size and image quality. At one point my son was going through a period where he was utterly amazed by space, planets and stars. If your kid is having one of those periods, too, then this printable birthday invitation might be just what you've been looking for. This high resolution space themed birthday invite is 15 cm x 10,61 cm in 300 dpi. Some kids dream of becoming a police officer, or a fireman, or a professional football player and then others dream about travelling through space as an astronaut facing the mystery of the unknown and maybe even meeting aliens. 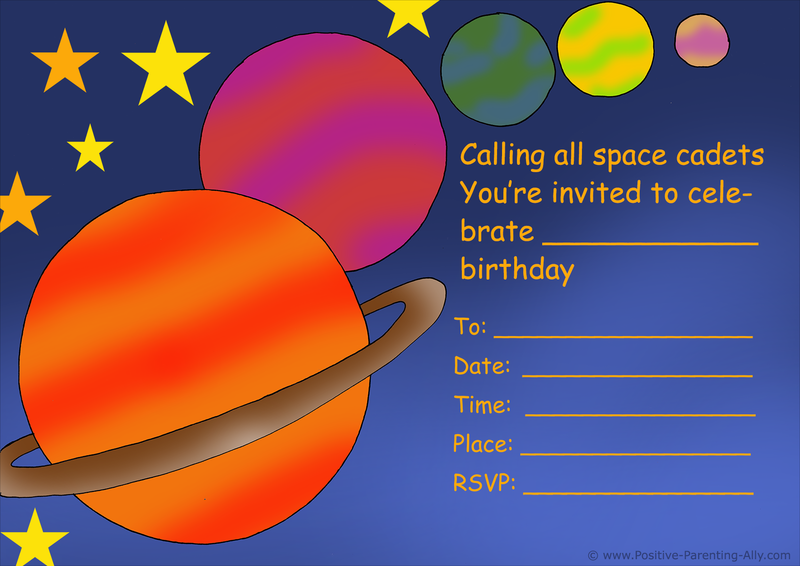 If your kid is fascinated by space, then why not go for this example of space-themed printable birthday invitations. 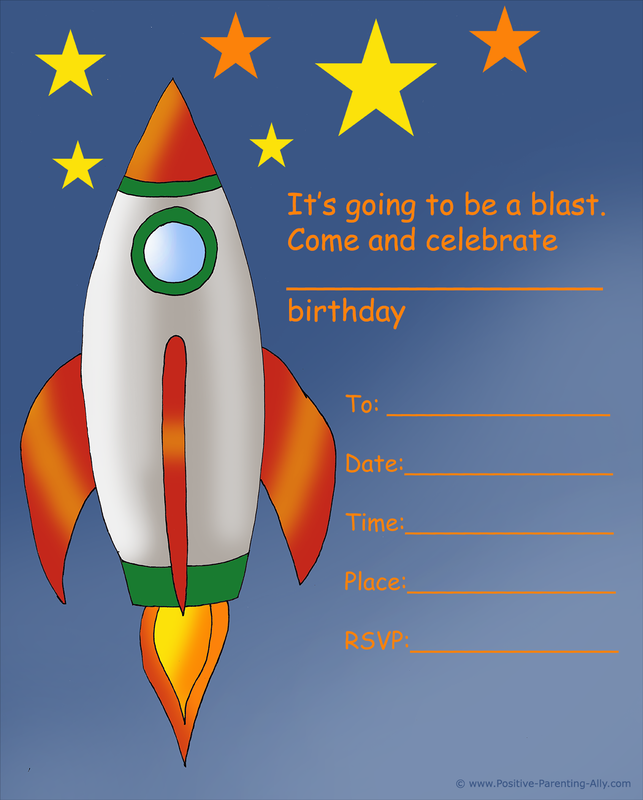 This space rocket kids birthday party invitation is 11 cm x 13,69 cm also in 300 dpi. One of my friend's daughter just loves being a host and serving me all kinds of small treats when I visit. She would just love the idea of having a tea party theme for her birthday. 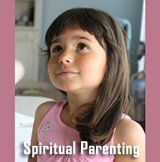 Maybe your kid would like that too? Then you could buy all kinds of herbal teas, some delicious butter biscuits and the kids could pretend to be fine British aristocrats having a posh tea party. 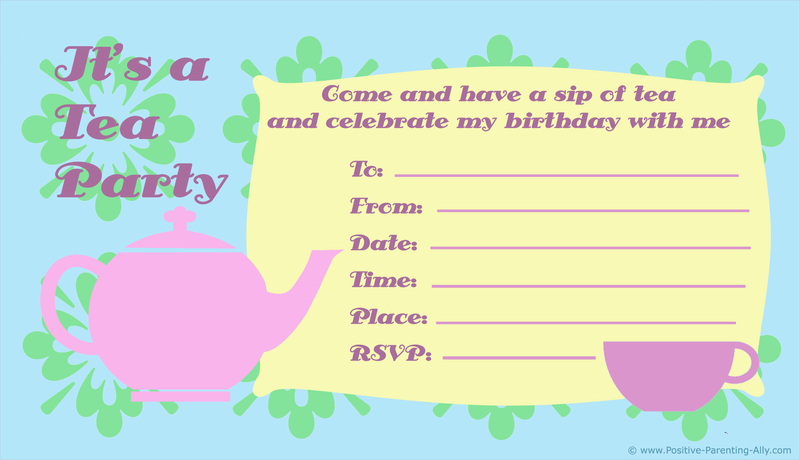 This tea party invite is 17 cm x 9,77 cm in 300 dpi. 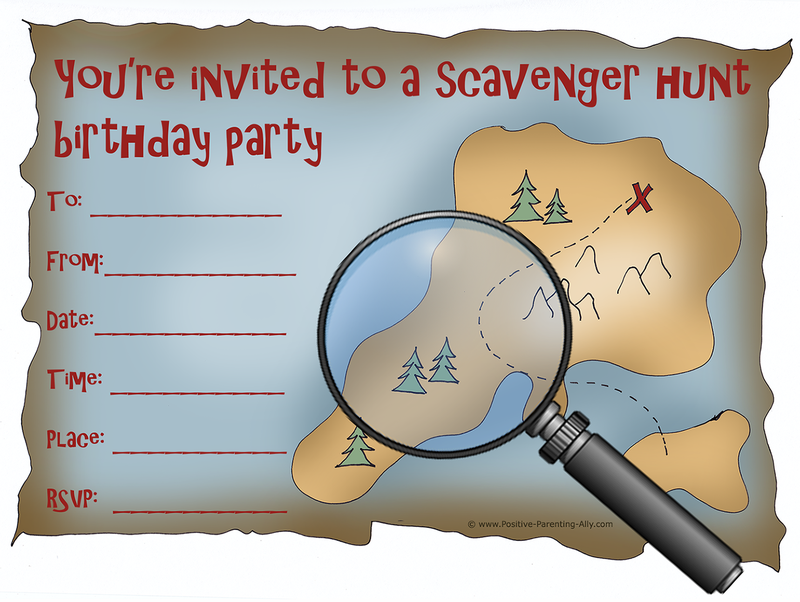 If you're planning a scavenger hunt on your kid's birthday, then this type of printable birthday party invitations with a treasure map might suit your theme perfectly. 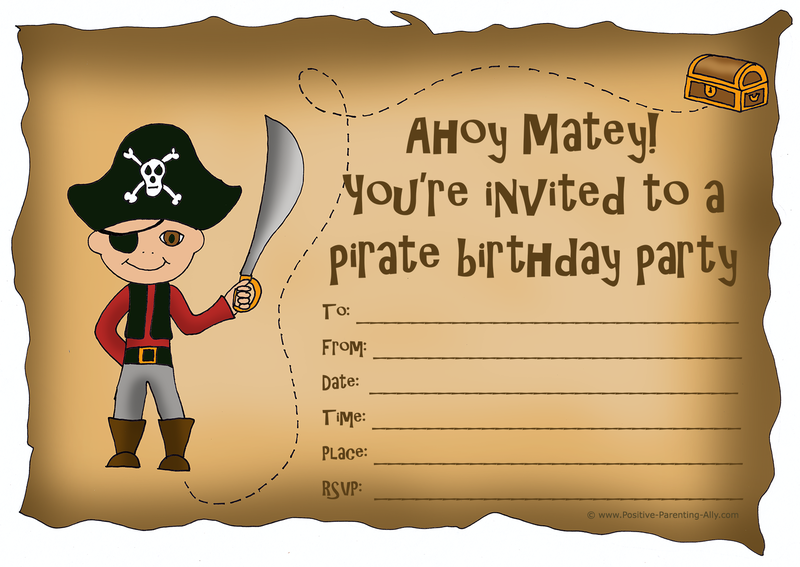 Just like all the other free birthday invitations on this page, this pirate invite has a high printing quality (300 dpi). The image size is 15 cm x 10,63 cm. Here is another printable birthday invitation featuring a treasure map, ideal if you're planning a scavenger hunt on your kid's birthday. The size of the invitation is 15 cm x 11,29 cm in 290 dpi. Considering renting a clown to come and entertain the kids, or maybe dressing up like one yourself on your kid's birthday? 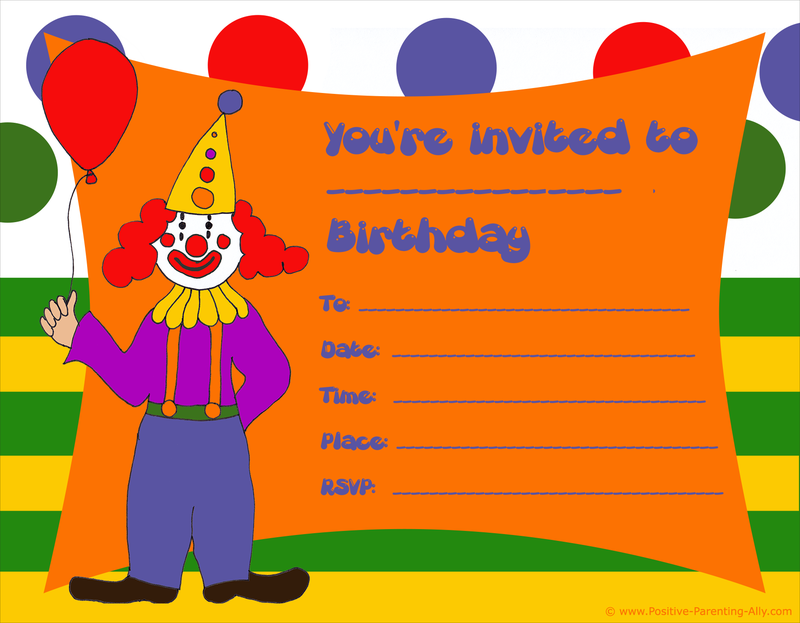 Then the above clown birthday invitation is going to be spot on. 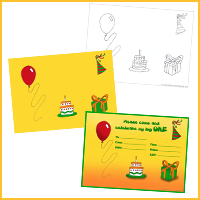 On this printable birthday party invitation remember to add your kids name and birthday age after it says, "You're invited to". The image size of this birthday invitation is 15 cm x 11,68 cm in 300 dpi. If your kid is so lucky to have his or her birthday during Easter, doing a fun egg hunt with the kids could be a brilliant idea. 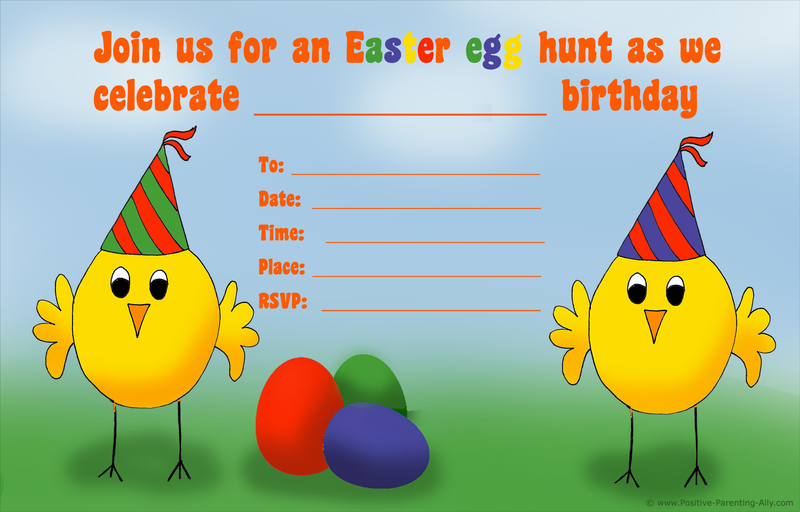 Sending out this Easter birthday invitation promising lots of fun, is surely to get the kids excited about turning up. 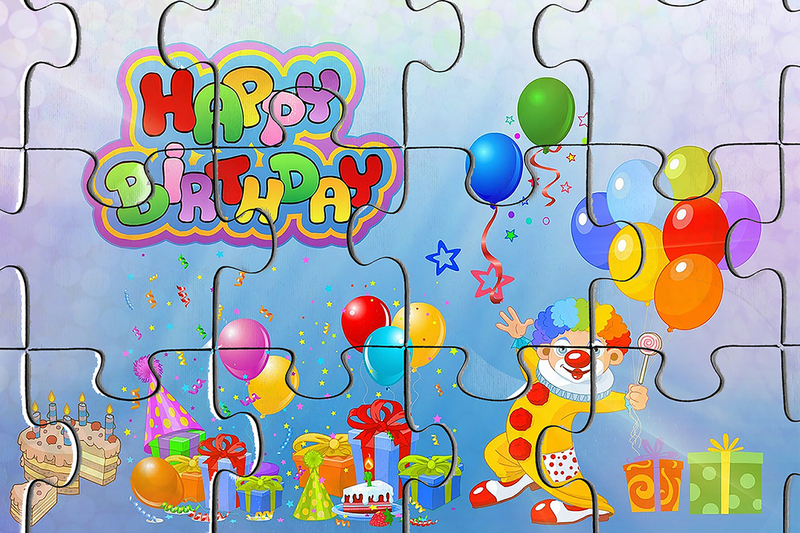 The image size of this one of printable birthday party invitation is 17 cm x 10,87 cm in 300 dpi. If in doubt, after it says, "Join us for an Easter egg hunt as we celebrate", you simply write your kid's name and birthday age. When my son was in kindergarten he was such a great fan of dinosaurs that he knew all their names. The dinosaur on this birthday invitation is actually from a photo I've taken of one of his precious toy dinosaurs. Pretty cool dinosaur isn't it? My son tells me it's a carnotaurus, which I've discovered actually means 'meat-eating bull' in Latin (carno = meat and taurus = bull). 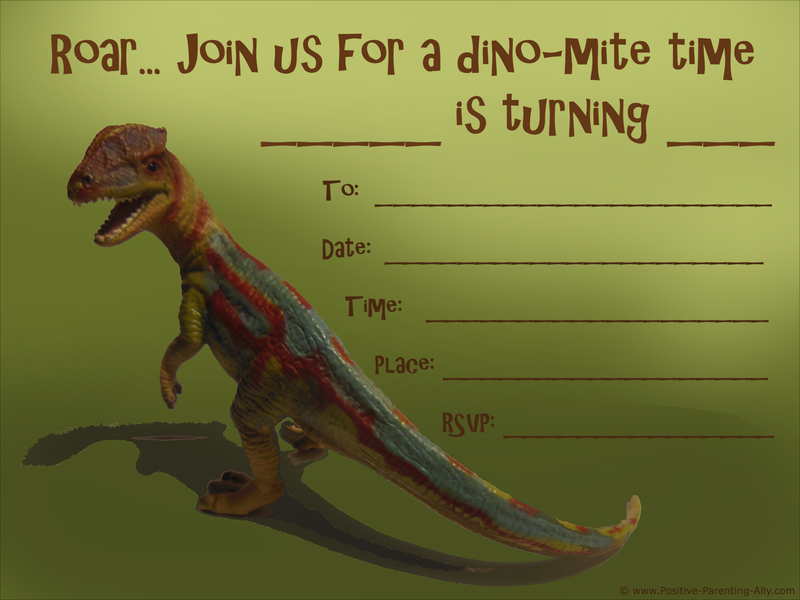 All you need to do after you've printed this dinosaur birthday invitation is writing your kid's name after "time" and his birthday age after "turning". The print size is 16 cm x 10,62 cm in 300 dpi. 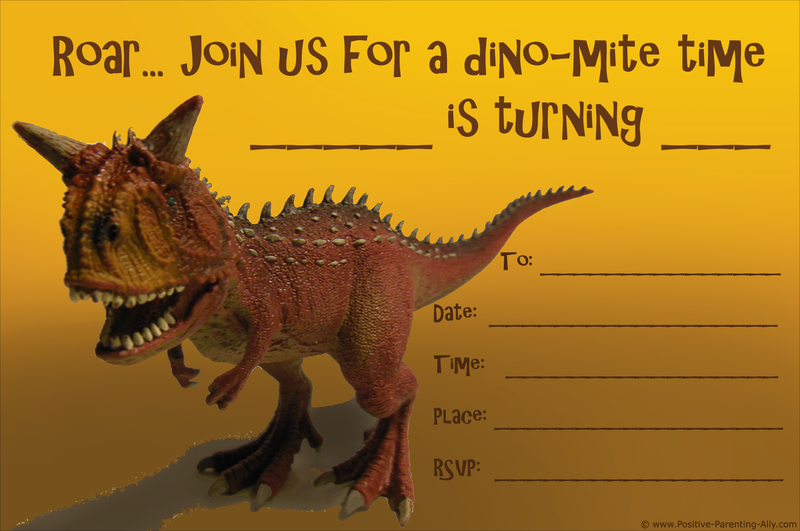 Here is another one of my son's toy dinosaurs featured on a birthday invitation. Yes, being a boy, he favored the carnivore types. The more dangerous, the better. I think this might be a dilophosaurus, but I'm not 100% sure. But regardless of name, it doesn't look like something you'd like to meet when it's hungry. 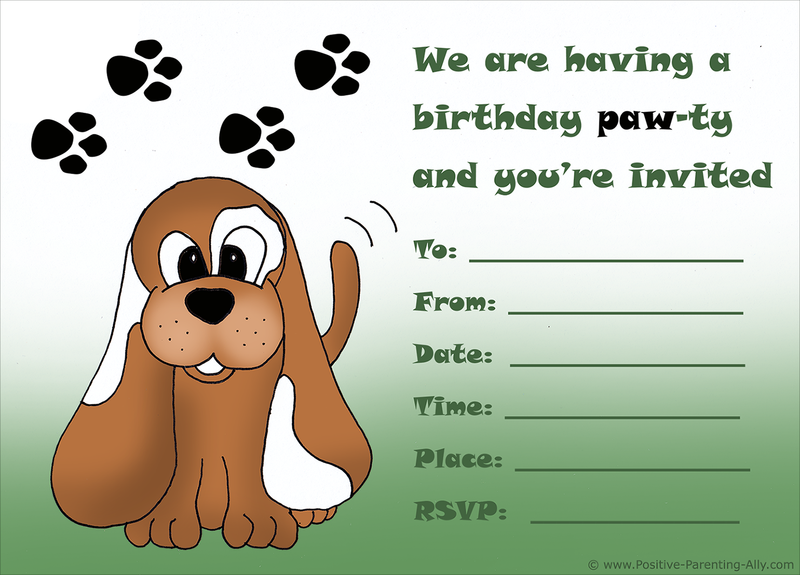 The image size of this one of printable birthday party invitations is 15 cm x 11,25 cm in 300 dpi. 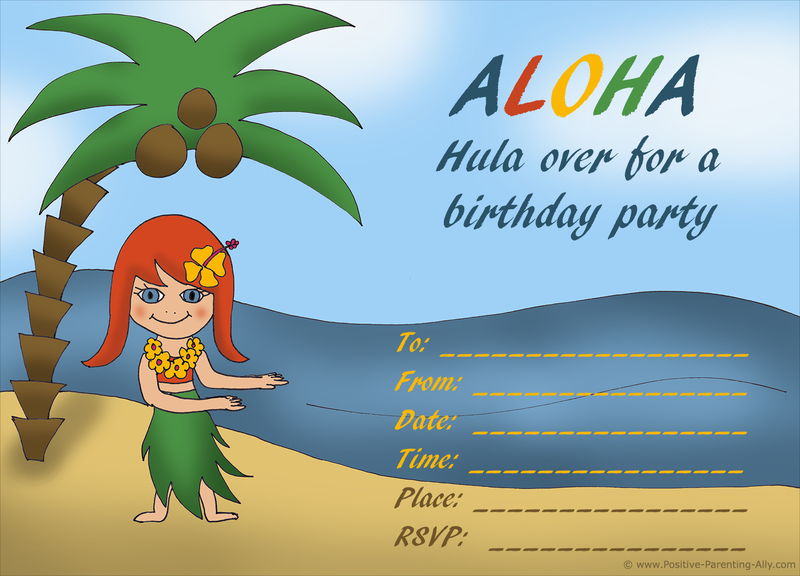 This Hawaiian printable birthday invitation with a hula girl dancing is great theme for a summer birthday party at the beach or in the garden. The size of the image is 15 cm x 10,8 cm in 300 dpi. Is your kid crazy about soccer? 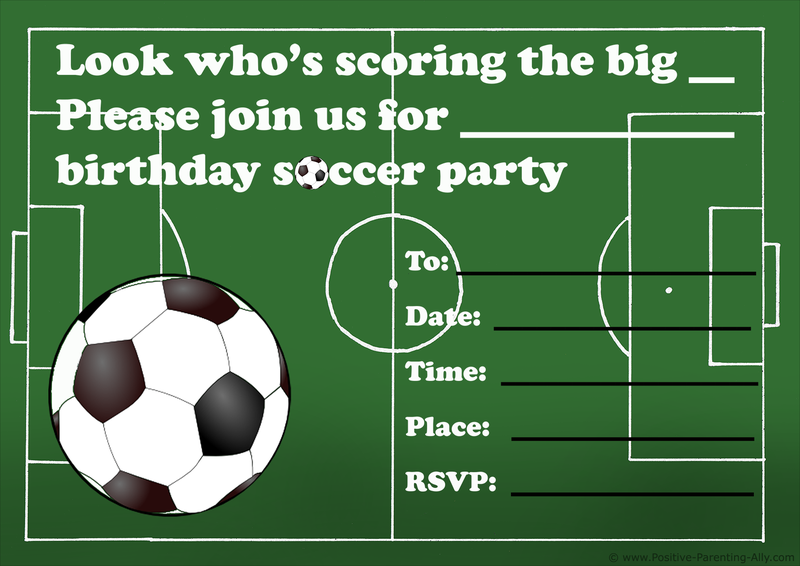 How about throwing a soccer themed birthday party using this invitation of a football field and a soccer ball? After it says, "big" you write the birthday age of your kid and after "for" you write the name of your kid. The print size is 15 cm x 10,62 cm in 300 dpi. 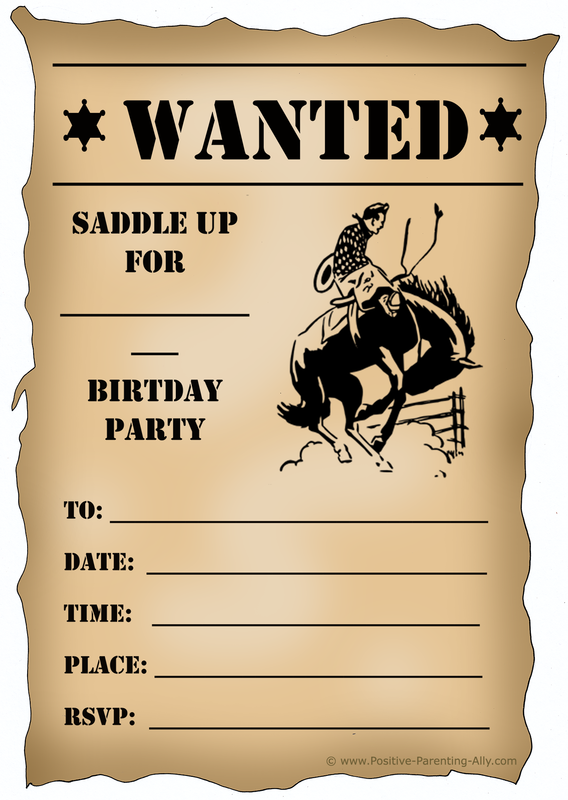 How about a 'wanted' poster as a fun birthday invitation? You could throw a birthday party with a fun cowboy theme where the kids had to e.g. learn to throw a lasso or make a bonfire to roast some sausages. This Wild West invite is 11 cm x 15,49 cm in 300 dpi. After it says, "Saddle up for" you write your kid's name and birthday age. 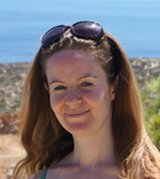 Making your own birthday invitations can be a challenge, especially if you feel you aren't as good at using computers as you might want be. However, you can easily make an invitation using Microsoft Publisher, as the program comes with a host of templates and card ideas that you can use to help be the guide for your card. You can go to this page, to find out how to make a birthday invitation with Microsoft Publisher. 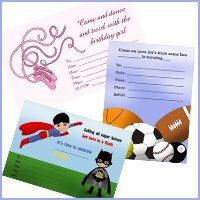 Coming up with the creative invitation idea is where the real challenge is, so it's important to consider carefully when thinking of what to do for the birthday invitation. One great idea for the invitation is to make each invitation on a single piece of card paper, and then cut each invitation up into small puzzle pieces. Pack each puzzle into an envelope, and send them off to invite your guests through this fun invitation. If you want to you can download the puzzle invitation I've made just below. It fits an A4 paper with the measurements of 28 cm x 18,66 cm. 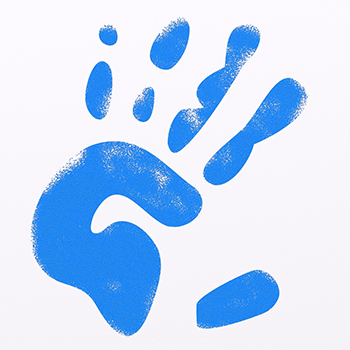 Another good idea is to have your child put their handprints on each birthday invitation, using finger paints to help you give the invitations the seal of approval. All you have to do is wait for the paint to dry, write the appropriate information on the card, and send it off! 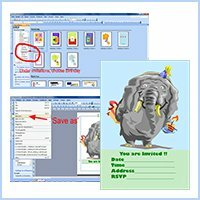 Trying to make your own birthday cards and invitations is a challenge, as it can be a whole lot of hard work to try and create birthday invitations and cards if you don't know how to use computer programs. Don't try to make it too complex - Unless you are a graphic designer, don't try to make the birthday card too complex with too many different artistic details and flourishes. Just keep it as simple as possible in order to make it easy to read all the details. 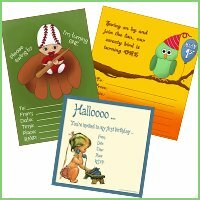 Don't make them too big - One thing to keep in mind is that you are going to be trying to send them out in envelopes, so they're going to have to fit in a standard size envelope to make them easy to mail. You may want to purchase the envelopes ahead of time, as that way you can be certain to make the card the right size to fit easily for mailing. Get the right paper - If you are going to be making birthday invitations, it can be a good idea to get thicker paper. Printing the invitations out on regular printer paper may be cheaper, but it doesn't give off the same impression as thicker paper does. Don't spend all your time making them - Don't worry if your invitation isn't coming out as professionally as you might like. It really doesn't matter that much. The kids will have their fun regardless of how the invitation looks. 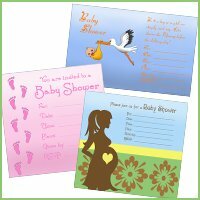 These are just a few tips to help you make the best invitation to suit your needs. But again, if you find you don't have the time for that or really can't be bothered, just grab one of my printable birthday party invitations on this page or find other examples through my links just below this article. 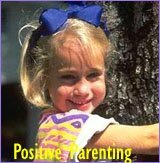 I wish you the absolute best birthday party for your kid and his / her friends.